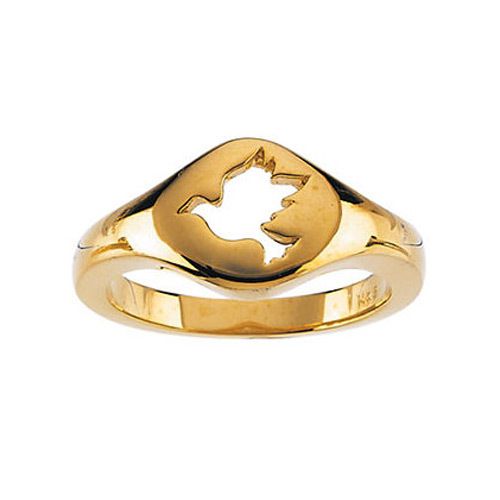 Made in 14k solid gold, this cut-out Holy Spirit dove ring for women, from Apples of Gold Jewelry, is a unique Christian ring that represents the Holy Spirit in the form of a dove, as He appeared during Jesus' baptism. The dove ring measures approx. 10.5mm at the face of the ring (between 3/8" to 11/16") and weighs approx. 4.95 grams of 14k gold. The Holy Spirit cut-out dove ring is also available in 14k white gold or sterling silver, shown below. We guarantee our 14K Gold Cut-Out Holy Spirit Dove Ring for Women to be high quality, authentic jewelry, as described above.